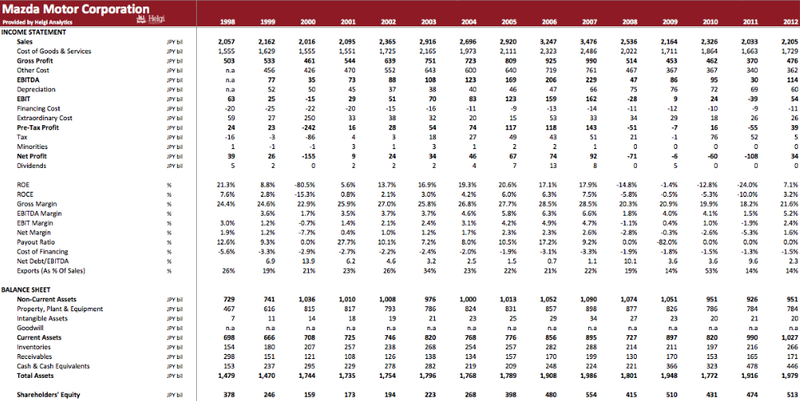 This Annual Statistical Dossier offers a comparison of 27 companies from Global Car Producers from 1980 to 2018 on an annual basis. The report can be downloaded as an Excel file. This Annual Statistical Dossier offers a summary of Mazda Motor Corporation's performance between 1998 and 2017 on an annual basis. The report can be downloaded as an Excel file. The Mazda Motor Corporation is a Japanese automotive manufacturer based in Fuchū, Aki District, Hiroshima Prefecture, Japan. Mazda began as the Toyo Cork Kogyo Co., Ltd, founded in Japan in 1920. Toyo Kogyo moved from manufacturing machine tools to vehicles with the introduction of the Mazda-Go in 1931. The company formally adopted the Mazda name in 1984, though every automobile sold from the beginning bore that name. In the 1960s, Mazda put a major engineering effort into the development of the Wankel rotary engine as a way of differentiating itself from other Japanese auto companies and has become the sole manufacturer of Wankel-type engines. From 1979 to 2010, Mazda had a partnership with the Ford Motor Company. 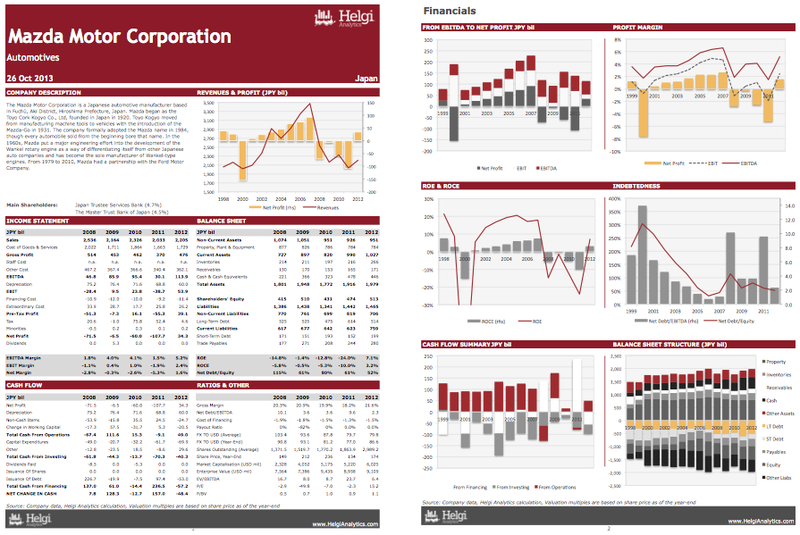 This report offers a summary of the company's performance in 1998-2012. You will find here all the key numbers from the company's balance sheet, income statement and cash flow on the annual basis. 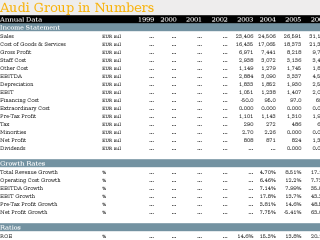 This excel file offers a summary of the company's performance in between 1998-2012 on the annual basis. You will find here all the key numbers from the company's balance sheet, income statement and cash flow and the main ratios related to the company's business. Mazda Motor Corporation made a net profit of JPY 112 bil in 2017, up 19.5% when compared to the last year. Total sales reached JPY 3,474 bil, which is up 8.08% when compared to the previous year. Historically, the company’s net profit reached an all time high of JPY 159 bil in 2014 and an all time low of JPY -155 bil in 2000. 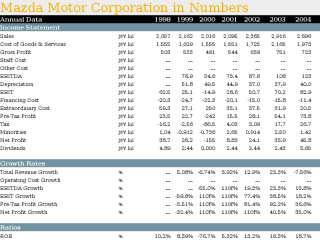 In terms of sales, Mazda Motor Corporation reached an all time high of JPY 3,476 bil in 2007 and an all time low of JPY 2,016 bil in 2000. Mazda Motor Corporation's net profit has grown 26.7% a year on average in the last five years while sales have increased by 9.52% a year since 2012. The firm generated its shareholders an average return on invested capital of 9.55% in the last five years. You can see all the company’s data at Mazda Motor Corporation Profile, or you can download a report on the company in the report section. Mazda Motor Corporation stock traded at JPY 1,512 per share at the end 2017 translating into a market capitalization of USD 8,222 mil. Since the end of 2012, the stock has appreciated by 77.8% implying an annual average growth of 12.2%. In absolute terms, the value of the company fell by USD -21,221 mil. At the end of 2017, the firm traded at price to earnings of 8.27x. Within the last five years, the multiple reached an all time high of 12.2x in 2016 and an all time low of 8.27x in 2017 with an average of 10.9x. In terms of EV/EBITDA, the stock traded at 3.57x at the end of 2017. Since 2012, the multiple reached an all time high of 7.72x in 2013 and an all time low of 3.57x in 2017 with an average of 5.86x. Mazda Motor Corporation made a net profit of CZK JPY 112 bil under revenues of JPY 3,474 bil in 2017, up 19.5% and 8.08%, respectively, when compared to the last year. This translates into a net margin of 3.23%. Historically, the firm’s net margin reached an all time high of 5.23% in 2014 and an all time low of -7.70% in 2000. The average net margin in the last five years amounted to 4.07%. On the operating level, EBITDA margin reached 4.21% and EBIT amounted to 6.72% of sales in 2017. Mazda Motor Corporation made a net profit of JPY 112 bil under revenues of JPY 3,474 bil in 2017, up 19.5% and 8.08%, respectively, when compared to the last year. This translates into a net margin of 3.23%. Historically, the firm’s net profit reached an all time high of JPY 159 bil in 2014 and an all time low of JPY -155 bil in 2000. Since 2012, the firm's net profit has increased 227% or 26.7% a year on average. On the operating level, EBITDA reached JPY 233 bil, up 12.1% when compared to the previous year. Over the last five years, company's EBITDA has grown 15.4% a year on average.